My good L., my business yesternight to dispatch me would not suffer me to take my leave. But hoping to see your L. ere long again I know you will excuse such ceremonies. And here my L., beside my very hearty recommendations, I must recommend to your good favour my suit for Sir Robt. Jermyn, for whom I doubt not but Mr. Secretary [Walsingham] hath told your L. how gracious her Majesty is therein. There was yesterday a great-bellied lady to have solicited the same but she was not able to tarry it out, your L. being with her Majesty in my chamber. She hath required her uncle your true servant to solicit this matter, for she & her husband are both much beholding to Sir Robt. Jermyn whose suit good my L. for all sakes give your honourable furtherance with what speed may be. And so from mine inn at Maidenhead I commend your L. to ye Almighty this 27 of August. which I need not much to trouble you with, considering I have written to your Lordship thereof already this morning; only I have now to let your Lordship know that her Majesty cannot be drawn by the opinion of her whole Council that be here, to grant them pardon or to give any man she will send authority to promise them pardon, if necessity should require, which we greatly fear may prove the loss of the town to her Majesty’s both dishonour and disadvantage. help towards his enlargement , or at least that he may be removed to some sweeter place. His age is great and his case is lamentable, … who without some speedy good order for his relief is like to perish in prison. Wherein I do very earnestly entreat your Lordship to … assure yourself there can be no greater honour than to forgive and help to raise up again such as are fallen so deeply as of themself they are in no hope to rise up again. Since your lordship’s departure her Majesty hath been earnest with me to lie in court, and this morning she sent to me that I might lie in your lordship’s lodging, which I will forbear till I know your lordship’s pleasure, except the Queen force me to it. For the last 27 years Robert Dudley’s apartments had always been nearest to the queen’s – this had not even changed during the courtship and visits of the Duke of Anjou (Elizabeth’s ‟frog“). Did Elizabeth have a foreboding that Leicester’s absence would last forever? Even as I had written thus much I received your Majesty’s token by young Tracy. that your lordship hath been troubled … with an ague at Cornbury Park whereof I am very sorry. Nevertheless I trust in God that through your lordship’s foresight and good order of diet, that you will easily and soon dispatch yourself thereof with good recovery of your health again in short time. The earl died, comforted by his wife and by his chaplain, in the early hours of 4 September 1588. The nature of his disease is uncertain, both malaria and stomach cancer having been suggested by historians. 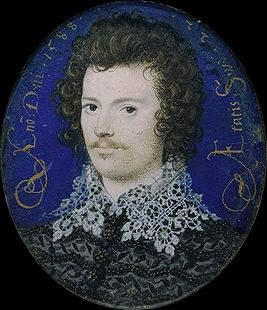 To free his father from the Tower, Sir James Croft’s son Edward had availed himself of a man called Smith; as soon as Smith heard of Leicester’s death he claimed to have bewitched the earl into eternity – the council, however, decided their colleague had died of malaria and let Smith go free. Elizabeth never quite recovered from the loss of the man she had loved and kept his note from Rycote in her bedside jewel box. On the outside she wrote: ‟His last letter“. Manuscripts of The Marquess of Bath, Volume V: Talbot, Dudley and Devereux Papers 1533–1659. (ed. D. G. Owen, 1980) Historical Manuscripts Commission. Hoak, Dale (ed.) (2002): Tudor Political Culture. Cambridge University Press. Watkins, Susan (1998): The Public and Private Worlds of Elizabeth I. Thames & Hudson. 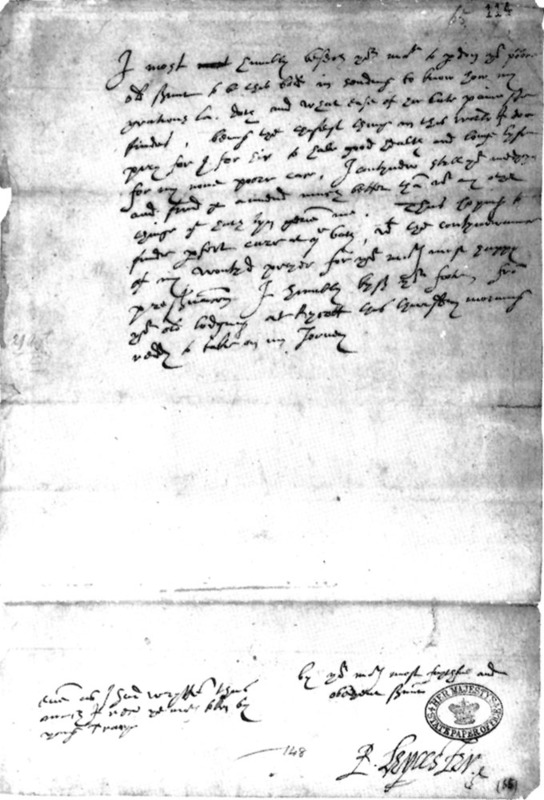 This entry was posted in Ambrose Dudley, Elizabeth I, letters, Robert Dudley and tagged Earl of Essex, Francis Knollys, James Croft, Penelope Rich, Rycote, William Cecil. Bookmark the permalink. That is so interesting Christine. I am delighted to have found your page. Equally delighted! Thank you — there is really lots of material out there! It is heartening to have discovered this site…what an intriguing period of history inclusive of a queen beyond compare. I am so grateful to you for posting this. Knowing how Elizabeth loved Robert there is sadness felt here, very poignant…especially keeping his last letter in her jewel box by her bed. Oh, Elizabeth how much you sacrificed for duty, respect, political “harmony” and the love of your people. You were indeed an amazingly strong woman. I will always love and admire you first of all Tudors.